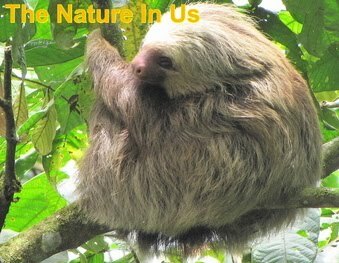 My dear neighbor, Ken Bushell, and I share photographs of the natural world. He and his wife, Yvonne, are both fascinated with the antics of the wildlife around us, as we are. Recently Ken sent me a photo documentary of a pair of Downy Woodpeckers that were building a home in a nearby tree at his house. Unlike most folks who like to take down dead trees, we all enjoy leaving them up so the variety of woodpecker species we have here in Central Virginia will have plenty of places to set up housekeeping. And that provides endless hours of enjoyment with no admission charge. 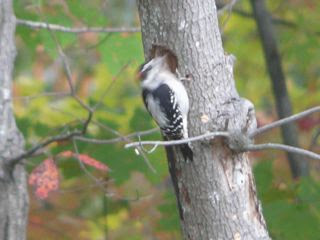 We have just had the delight of watching a pair of Downy woodpeckers build a home right in front of our eyes. They chose a small dead tree (trunk 4 inches diameter) situated 50 feet from our living room window and with the nest hole conveniently facing us. All photos were taken with a Panasonic FZ18 with x 18 zoom (= 504mm in equivalent 35mm terms). My initial photos were taken from inside the house and later I took some outside. The close-ups at the bottom have digital zoom of approximately x3 (making it over 1500mm equivalent). We are not exactly sure when work started, but we think it was on October 18 when we first noticed activity and when the first photo was taken. The red head signifies the male bird. The second photo shows lots of speedy drilling which provided many fuzzy shots like this. 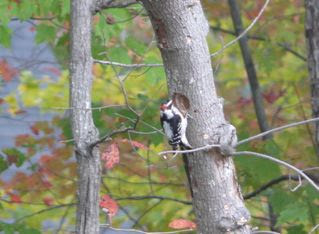 Downy Woodpeckers readily visit backyard feeders where suet and peanut butter are offered. Their familiar drumming rolls are commonly heard in the spring, and have awakened many when they choose a drain spout, mailbox or other metallic surface to announce their territory and attract a mate. One might think that the woodpecker is trying to hammer a hole in the side of the house, but this type of drumming is much different than the drilling that they do to excavate a cavity nest. It's purpose is to send out a mating call. The female usually selects the nest site in a dead deciduous tree or branch, but they will also use fence or utility poles if necessary. The location can be from 8 to 50 feet high off the ground. Who excavates the cavity is of differing opinions when you research the topic. Some say it is mostly accomplished by the male, some the female, and other that both of them drill. From our observation and these photos, this pair of Downies are doing it together. On October 19, this female was spotted helping with the digging. This couple was building in the Fall to have a good roosting place for winter in a spot that was near seed and suet feeders. They will most likely choose a different location for their nesting season. 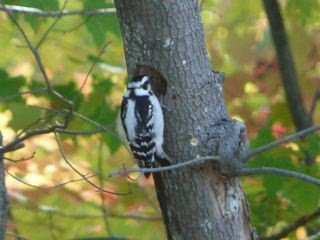 Downy Woodpeckers begin nesting in late Winter and some are known to mate for life. Some pairs stay together through the year, and the supply of food available seems to be a factor in determining whether mated pairs stay together past the breeding season. Where food is more plentiful it is more likely that pairs will stay together year-round. As the day progressed, the male got further and further inside as he regularly inspected their work being done. Late in the day, they had excavated enough for the male to get almost totally inside for the first time. Seems they would be drilling in the dark after they get the entrance tunnel built and then have to head downwards for the nesting area. 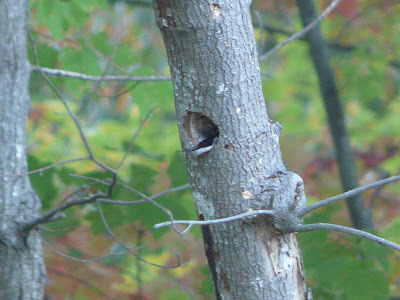 On October 20 the male continued the task of drilling, but at one point a White-breasted Nuthatch came by to inspect the cavity also. 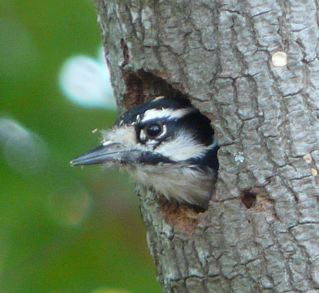 These birds also nest in natural cavities or abandoned woodpecker cavities. When the birds are drilling the initial entrance, the chips of wood fly about and get on their feathers. After they begin drilling downward for the cavity, they have to remove all the fragments chipped away, so they are seen carrying them out as evidenced in this photo. All research online stated that it takes about two weeks to excavate a hole big enough to start a nest; however, this one seems to have been made in three (3) days. We can only surmise that building a roosting place is much different than building a nest. Photographs of the inside of the hole showed that the excavation did go deep as a typical nest would. Maybe it was completed so quickly because this particular tree is in pretty bad shape with many holes on the backside. Matter of fact, you could see light coming through the rear of the area they had just drilled. When they are finished with an actual nesting cavity they don't furnish it with anything fancy. They just drop wood chips into the hole. The male is shown here removing wood chips from the excavation process. 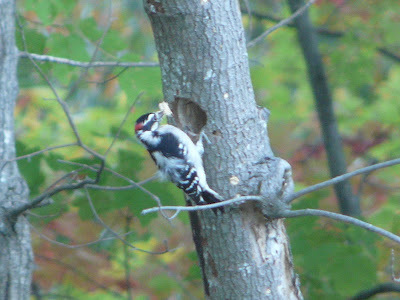 Woodpeckers depend on fungi to weaken dead wood before they start excavating it. Polypores, such as the Spongy-toothed Polypore, are the main types of fungi which prepare dead trees for woodpeckers. Some people believe woodpeckers are killing live trees when they see them climbing and pecking away, but they are actually providing a service by getting any bugs out of the wood that might injure it or create a disease problem. Keeping dead trees is important because they not only provide sites for nesting, but also provide food for the woodpeckers. One of the special anatomical trait of woodpeckers is the long, barbed tongue that searches crevices and cracks for food. The salivary glands produce a sticky, glue-like substance that coats the tongue and, along with the barbs, makes the tongue an efficient device for capturing insects. Woodpeckers are a family of birds sharing several characteristics that separate them from other avian families. Most of the special features of their anatomy are associated with the ability to dig holes in wood. The straight, chisel-shaped bill is formed of strong bone overlaid with a hard covering and is quite broad at the nostrils in order to spread the force of pecking. A covering of feathers over the nostrils keeps out pieces of wood and wood powder. The pelvic bones are wide, allowing for attachment of muscles strong enough to move and hold the tail, which is important for climbing. What fascinates me most about the entire process is how they get the hole the exact diameter that's recorded for the species to nest in. Incredible!